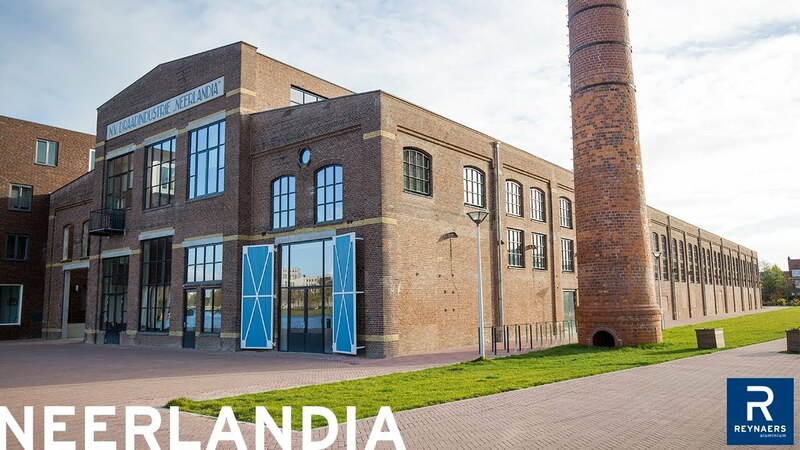 The former site of the wire factory Neerlandia on the Vaartsche Rijn in Utrecht has been redeveloped into an attractive residential estate. This reconversion consisted of the creation of apartments in the oldest factory building, the demolition of the warehouses to make way for new terraced houses on traffic-free streets and the transformation of the quay into a public pedestrian area. With the redevelopment of this site, ZEEP architects and urban designers has connected the estate with the water, while keeping the memory of the industrial past alive. Very few traces of the industrial activity are left along the Vaartsche Rijn in the Hoograven district of Utrecht. After years of disuse, most of the factory chimneys and buildings had either collapsed or been demolished. A similar fate awaited the Neerlandia factory. Clout-nail factory Neerlandia has been redeveloped into an apartment building. It was built in 1914 as Chemische Fabriek v/h Dr. F.C. Stoop. From 1932, Draadindustrie Neerlandia produced clout-nails and all kinds of wire at the factory and extended the complex with eight warehouses. After rag and scrap metal business Prozee left, who used the site from 1973 to 2002, the complex lay empty and fell into disrepair. One particularly eye-catching feature of the project is the 35m chimney. This used to stand where the first new apartment block is now situated next to the old factory building. Although one side aisle has gone, the factory’s original cathedral-like structure – a nave with side aisles – has been retained. New steel rafters, which reveal the contours of the removed side aisle, connect the factory with the new houses, which were built where the old warehouses once stood. The historic façades have been fitted with new high-quality aluminium windows reminiscent of the old steel windows. Poolen: ‘The original steel windows were multi-paned windows with fine glazing bars and a slimness closely matched by the renovation profiles by Reynaers Aluminium. The only windows in the side aisles were high up. Obviously, more windows were needed for the residences. By putting the car park under the factory, we were able to retain the closed frontage on the ground floor. Above this, we added new windows, right below the existing ones.’ The result is a balanced frontage. The historic façades have been fitted with new high-quality aluminium windows reminiscent of the old steel windows. The long south façade has a high level of noise exposure because of the nearby A12, which is why double windows were fitted here. The interior window can be opened and the fixed exterior multi-paned window offers soundproofing and has an 80mm gap at the top and bottom for ventilation. Slim aluminium windows were also used in the nave, while larger aluminium windows have been fitted in the end façade on the quay. Hotel and catering facilities will soon be moving into this space on the ground floor. Façade construction company Alkondor fitted all the windows. A look inside the appartments. Access to the residences is via two entrance halls at the beginning and end of the street on the north side. Tall aluminium windows flood these halls with natural daylight and lights from the old factory illuminate the entrances at night. The inner street with apartments on the first and second floors can be accessed from the entrance halls, and a gallery gives access to the larger apartments on the third floor. In the end façade on the quay, five lofts with balconies were created above the catering space. The new easterly end façade has a modern design with an industrial look. Within a frame of black steel H-beams, the façade has been clad with bronze coloured anodised aluminium sheets. Displayed within this frame is a picture of the Neerlandia factory before the renovation, created using perforated aluminium sheets. This was done by making a negative image of an old photo, which was then transformed into perforations varying from 6 to 18mm. Narrow window strips have been created here and there and in the middle, there is a big recess where an entry to the car park is situated as well as the inner street between the residences. Steps and a fire escape staircase have a corten steel balustrade. The design of the new eastern façade is modern with an industrial character. This is due to the façade cladding with bronze-colored anodised aluminum sheets. One particularly eye-catching feature of the project is the 35m chimney. This used to stand where the first new apartment block is now situated next to the old factory building. At the start of the redevelopment in 2012, the chimney was dismantled and rebuilt on the other side of the old factory in 2017. It looks better than before because the old crumbling chimney top has been replaced with a new one. The residential streets provide an intimate atmosphere in the neighborhood. ‘In an earlier phase, we built four strips of terraced houses square to the quay with a small apartment block by the water in the end façade. The contours of the old factory warehouses formed the basis for the allotment,’ Poolen explains his plan for the estate. The intimate streets are not accessible to cars; these can be parked in the car park under the quay. The residents have been making the street their own with benches and flower boxes. The wide public quay enriches the estate as a place for people to enjoy by the water.